Off Limits Event Professionals have over 50 years of combined experience within the event management and team building industry. Save time and money for your organisation by letting Off Limits do all the ground work for your next conference or event. As a company we provide an extensive service from initial enquiry to billing after the event. 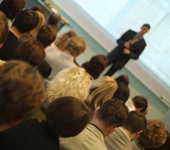 Once we have your conference brief we will discuss your overall objective to gain a full understanding of the elements you consider to be vital in achieving the maximum return from your conference. In addition we can add value to the event by suggesting additional options that we feel would benefit you such as Ice Breakers to get the conference off on a positive note or a management consultant to provide overall feedback from the guest's participation.